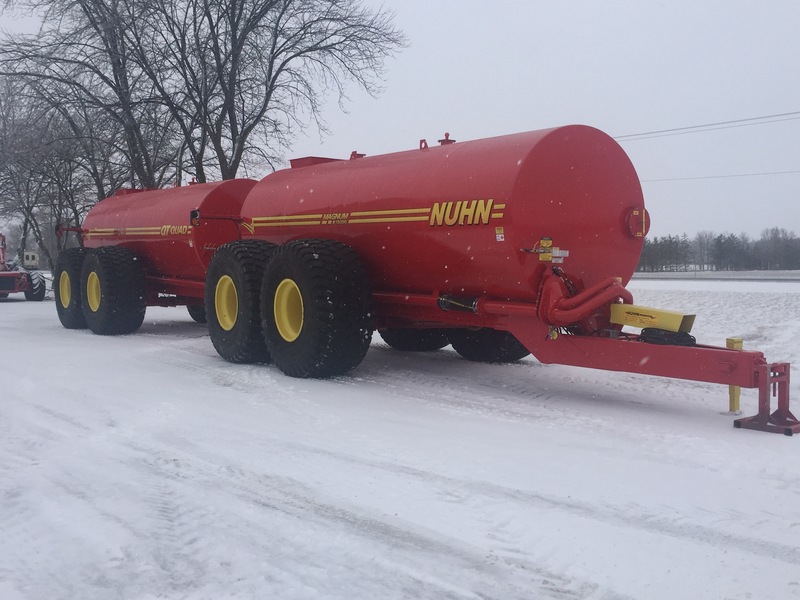 Sales of the Nuhn Industries huge 15000 Quad Train manure spreader jumped once the company began outfitting it with more durable radial tires—35.5R32 Alliance 393 flotation radials. The boost to Nuhn tanker sales coinciding with the introduction of the new, large, high-performance tires suggests that tires can play a key role in farm machinery innovation. PHOTO CREDIT: Nuhn Industries, Ltd. The tremendous weight of the machinery—twin tanks containing 15,000 gallons of manure, hauling more than 120,000 pounds over the road on tight-turning, heavy tandem axles—puts tires to the test. (That’s more than 15,000 pounds per tire.) The bias tires Nuhn formerly used on his tanks—which were the biggest available at the time—often failed early due to extensive heat buildup, he says. The Alliance 393 is engineered to reduce heat buildup on the road. At an inflation pressure of just 32 psi, each tire is rated for a load of nearly 20,000 pounds at 31 mph—plenty even for the 120,000-pound, fully loaded 15000 Quad Train. The steel belts underlying the 393’s tread improve puncture resistance and ensure a broad, flat footprint, dramatically reducing soil compaction—a key concern for manure applicators operating in wet, compaction-prone fields. Over the past two decades, Nuhn has worked with his tire dealer to put Alliance’s line of flotation radials through tough real-world testing. Their feedback has helped Alliance develop several flotation tires that have become global leaders in performance, including some of the world’s fastest high-speed flotation tires, says Bruce Besancon, Vice President of Marketing for Alliance Tire Americas. Nuhn says his relationship with his tire supplier has been fundamental to his role as an innovator. Unusual flotation tires are still stopping farmers and professional applicators in their tracks at trade shows, Nuhn says, including the Alliance 393 radials, with their distinctive square-shouldered block tread. “People like the look of the square top,” he notes. 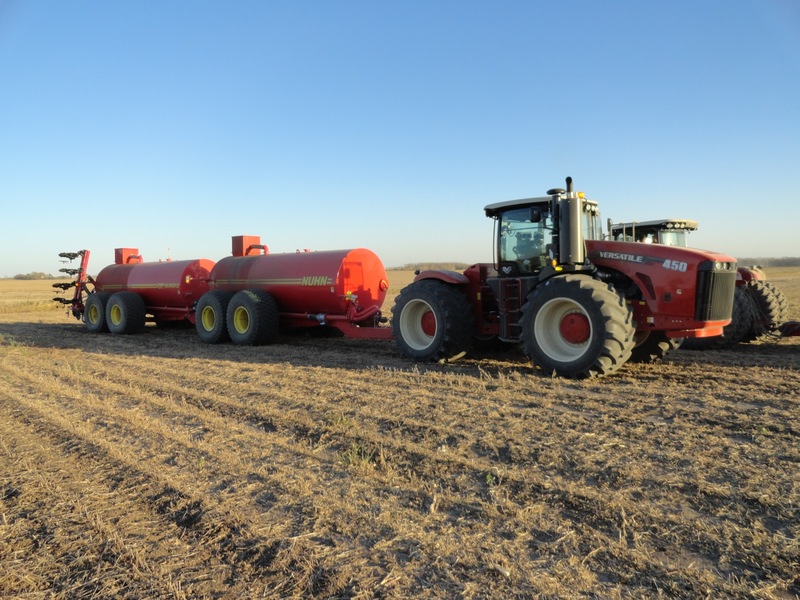 And as more Nuhn 15000 Quad Trains roll across North America, owners will like the look of their bottom line as they get greater performance and productivity than ever from their massive manure tanks.